FFA - Paterson New Jersey proclaimed May 19, 2013 “Palestinian-America Day” and flew Palestinian flag over city hall. The recognition of Palestine as American by raising the flag over Paterson City Hall and issuing a proclamation is insulting to millions of Americans. 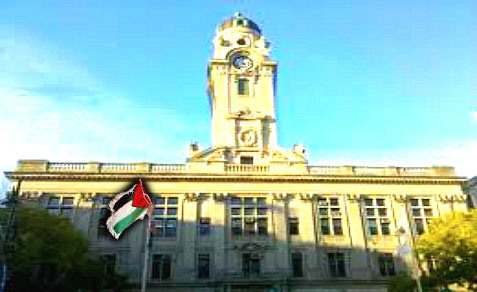 Paterson New Jersey appears to be the first city in America to raise the Palestinian flag over a government public office. The community leader who solicited government proclamations for naming May 19 ‘Palestinian American Day’ in Paterson, NJ had publicly expressed outrage over NYPD surveillance of Muslims. No one even noticed he was a convicted felon. On the same day that many Americans were celebrating Israeli Independence Day, Paterson, New Jersey Mayor Jeffery Jones named Sunday, May 19 “Palestinian-American Day” in his city, and a Palestinian flag was hoisted over Paterson’s City Hall. 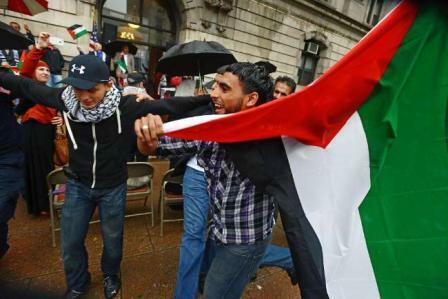 New Jersey City Raises Palestinian Flag Over City Hall – HAMAS CITY USA; Got Amnesty?! As longtime readers know, I’ve written about Paterson, New Jersey many times, noting that it has the largest concentration of Palestinian Muslims in the United States, North America, and practically anywhere outside the Palestinian Authority and Gaza. As I’ve also noted, even leftist MTV News broadcast reports showing thousands of Palestinian Muslims outside Paterson’s town hall, cheering the 9/11 attacks against America (and starting a riot using cement garbage cans and metal poles, which they used to strike police). Now, Paterson has made official what we’ve known for a long time: that it is Muslim-occupied territory. After all this proclamation production in the U.S. city with the most Palestinians only 150 people showed up. That shows how much they care about American recognition. To most Americans the Palestinian flag conjures up images of Jihad, lethal anti-Semitism, homicide bombers and hate for America. The recognition of Palestine as American by raising the flag over Paterson City Hall and issuing a proclamation is insulting to millions of Americans. Additionally, combining the words Palestinian-American Day is even more repugnant. Folks, this is how it starts. Symbolic acceptance is the beginning of the end to the American way as many treasure it. Florida Family Association has prepared an email for you to send to Paterson, New Jersey Mayor Jeffery Jones; Paterson, New Jersey City Council members; Congressman Bill Pascrell, Jr. (D-NJ9) and New Jersey Assemblyman Thomas Giblin (D-NJ34) objecting to the raising of the Palestinian flag and related proclamation.